The Comboni Missionaries "Facing the refugee crisis"
Kampala (Agenzia Fides) - On Sunday, July 29, 2018, the official launch of the celebrations for the 50th anniversary of the birth of the Symposium of Episcopal Conferences of Africa and Madagascar (SECAM) was held in the Cathedral of the Sacred Heart of Kampala, celebrations which are expected to climax next year on July 29th, 2019. The theme for the Golden Jubilee celebrations with be: “Church, Family of God in Africa, Celebrate your Jubilee! Proclaim, Meet and Welcome Christ your saviour. "In fact, whoever says SECAM says Church of Africa" Father Donald Zagore, a priest of the Society of African Missions, explained to Fides. 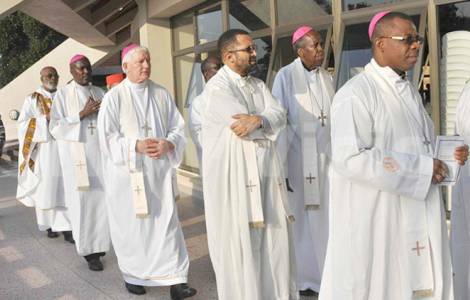 SECAM, a body composed mainly of Bishops from Africa and Madagascar, wants to be an organ, an engine of pastoral and missionary action for the entire Church in Africa. It represents the prophetic voice of the sufferings and joys, as well as of the hope of all the people of the African continent in general, and of the Catholic Christians of Africa in particular. "This organism assures unity in the diversity of our Church in Africa, trying to be its voice par excellence", continues Father Donald. "A very complex mission that continues to move forward. Despite the great work done so far, there are still many challenges that this pastoral body has to face. It is time for the African Church, through SECAM, to acquire its own identity to contribute meaningfully and constructively to the universal debate, through a theological language, a liturgy, a vision of man, of nature, of the relationship with others. In other words, it is time for the African Church to present its own form of Christianity, which naturally continues to nourish and enrich itself, while it nourishes and enriches the universal dynamic of Christianity", underlines the Ivorian theologian. "In an African socio-political context still marked by division and war, the Church of Africa, through SECAM, must continue, with ever greater apostolic and prophetic zeal, to be active and committed in the struggle for justice, peace, and reconciliation. It is expected that this church, through SECAM, will be at the forefront, more visibly and perceptibly in the fight for justice in Africa. As the theme of this jubilee indicates: ... announce Jesus Christ your Savior, we hope to see a much more mature Church of Africa, which no longer considers itself in the unique perspective of missionary land but becomes the source from which the boundaries of the earth begin, which sees a multitude of missionaries ready to proclaim and witness Christ, the only Savior.